Question: It has always been that Adiseshan performs service to Lord Vishnu. Then why did Adiseshan appear as Lord Krishna’s elder brother in Lord Sri Krishna avatar? Would it not have been appropriate that he should have been born as Sri Krishna’s younger brother? 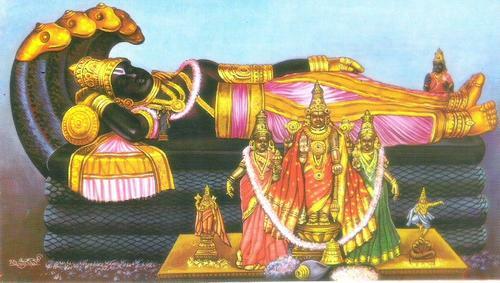 When Vaikuntha’s gate keepers Jaya-Vijayal were cursed by Sanakadhigals, they appeared as Hiranyakashipu-Hiranyaakshan and Ravanan-Kumbakarnan demons (asuras) at different times. The Lord appeared as Varaha Avataram (incarnation), Narasimha Avataram, and then as Rama Avataram and destroyed the demons. During all these avatarams, The Lord first destroyed the younger brothers of the demon duos and then the elder ones. Then The Lord takes Krishna Avataram to destroy Sishupalan and Tanthavaktran duo. The asuras (Demons) always form their revenge strategy in the same manner as they were destroyed before. So the next time they may plan to revenge on the younger brother. Hence in order that He Himself be targeted as the object and person of contempt for the asuras and thus protect Adisesha from their unnecessary wrath , Lord Krishna appeared as the younger brother of Balarama nand played some of His Avatara Leela against the demons!